Restore 4 Reviews - Is it a Scam or Legit? Restore 4 is a phosphoric acid cleaner that claims to address hard water, lime scale, and rust stains on many surfaces, including porcelain, fiberglass, and real metals. Made without bleach, ammonia, or abrasives, Restore 4 is a professional restorer that promises to penetrate grout, porcelain, fiberglass, and real metals like copper, stainless steel, and chrome, dissolve almost any stain, and make them look new again. This includes hard water, lime scale, calcium deposits, scum, tarnish, and rust, whether on fixtures or tile counters, walls, and floors. Just pour Restore 4 on the surface, let it go to work, and wipe it off—the manufacturer claims you’ll be left with a fresh wintergreen scent that doesn’t just remove stains, but also kills pathogenic bacteria. Then, you can use the Grout Restorer to continue helping block stains and mildew. If you’re looking to go beneath the surface and tackle a variety of stains on many different surfaces, the commercial certainly makes Restore 4 seem like a viable option—especially instead of spending extra money replacing these same items. But is this formulation necessarily your best option? Are there any special considerations regarding its ingredients? Here, we’ll help you find some answers so you can make the most informed decision possible, starting with price. How Much Does Restore 4 Cost? 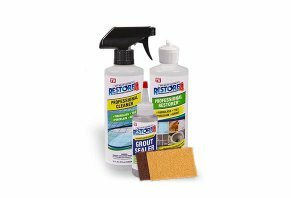 One Restore 4 system that includes Professional Cleaner, Professional Restorer, Grout Sealer, and Beige (for new grout and tile) and Burgundy (for old grout, tile, and heavy stains) Cleaning Pads, is priced at $19.95, plus $7.99 S&H. You can purchase a second system during checkout for an additional $7.99 fee. At the time of our research, you could also purchase two Restore 4 systems through Amazon for $49.99 plus free shipping. If purchased directly through Tristar Products, Restore 4 comes with a 60-day empty bottle guarantee, less S&H (be sure to keep this in mind if you plan on ordering the BOGO offer). To process a refund, customer support can be reached at 973-287-5166. How does this price compare to competing restoration formulas? We’ll answer this important question in a second. But before we get there, let’s quickly discuss the basic concept behind these type of cleaners. What Ingredients Does Restore 4 Use & Are They Effective? While there wasn’t a full ingredients list or label provided on the Restore 4 website (this is common for cleaners in general, from any manufacturer), the product’s FAQ indicated its active ingredient is phosphoric acid. This includes strong acid cleaners typically intended for heavier duty tasks, like Restore 4, since phosphoric acid effectively attacks inorganic deposits and quickly removes them. As such, you’ll commonly find phosphoric acid cleaners geared toward use on masonry surfaces like marble, granite, ceramic and porcelain tile, and concrete. However, some formulas are specifically geared toward cleaning metals. Given its usefulness, are there other phosphoric acid cleaners competing with Restore 4? Are There Other Phosphoric Acid Cleaners Like Restore 4? Searching online for "phosphoric acid cleaner," we encountered a handful of meaningfully similar options as Restore 4 (based solely on their inclusion of phosphoric acid, and not based on their specific formulations or firsthand testing), from brands like Miracle Sealants, Glaze ‘N Seal, and 3M. These came in containers ranging in size from 32oz to one gallon or more, priced between $12 and $40. While some of these might represent steeper initial investments than Restore 4, their meaningfully larger sizes could translate into greater overall per-ounce value. And if you toss other acids into the mix, such as phosphoric and oxalic, your number of options will increase exponentially. DoItYourself.com indicates that you can even make your own strong acid cleaner by diluting any phosphoric, muriatic, or sulfuric acid you might have lying around the house, there perhaps saving you even more money. Given the potential danger, though, we’d recommend taking extreme caution. As far as Restore 4 specifically, it appears to be a reformulated version of the original Zap Pro, which contained diluted muriatic acid. Both even feature the same wintergreen scent, two different scrubbing pads, and are offered through Tristar Products. While Zap Pro didn’t have any customer feedback here on HighYa, the original formula seemed to have a middle-of-the-road customer reputation on Amazon. While many claimed it worked great, the most common complaint was that it didn’t live up to expectations. Obviously, Restore 4 represents a completely different acid-based formula than Zap Pro, so we’re only providing you with a complete overview of the situation—not indicating that you’ll experience any of the same. Compared to other phosphoric acid household cleaners, perhaps one of Restore 4’s standout features is that it’s a three-part system, including a cleaner, a restorer, and a grout sealer. However, unless you’re specifically cleaning grout, a full third of this system might go to waste, which might not represent the most valuable use of your money. Speaking of which, if you’re simply looking to obtain the most phosphoric acid cleaner for the money, you’ll find gallon-sized formulations from the competition for as little as $30—only $10 more than 20oz of Restore 4. Some of these are even available at national big box home improvement stores, which could help get them in your hands faster while avoiding S&H charges. What’s the bottom line? Ultimately, we’re here to provide you with the information and leave it up to you how to spend your hard-earned money. But as consumers ourselves, it might be difficult to overlook the potentially much better per-ounce value offered by the phosphoric acid cleaner competition. And while Tristar seems to stand behind its product with a 60-day refund policy, you’ll immediately lose you initial S&H charges, plus whatever it will cost you to ship it back if you decide to give it a shot and are dissatisfied. Finally, like any acid cleaner, be sure to keep it away from skin and eyes and use only in well-ventilated areas. I bought my over 70 years old house 5 and 1/2 years ago. I have tried everything to remove the stains on the porcelain in the sinks, tub, shower, and toilets. Over the years I'd guess that I've spent a couple of hundred on different products. I bought this Restore 4 stuff last week, in my quest. I sprayed it on, let it sit for a couple of minutes, and wiped the stuff off. It came up very easily and I have no more stains. It also makes the chrome on handles and valves sparkle. This stuff is fabulous! I purchased this product from Lilly's As Seen on TV in Tennessee. I did not know anything about it, and the clerk said they just received it in. I brought it home and used it on my bath tub to remove the stubborn stains and build up. I have tried other leading cleaners that did not work. This stuff worked just like it said on the instructions. I am amazed at how this stuff works. I purchased one bottle, and now I may have to go back to Pigeon Forge to get some more. Write a Review for Restore 4!